He asked, you said yes.. now what? I always knew from a young age I wanted to marry in Aruba. We had traveled there every year. It was comfortable to me, it was my second home. Being a wedding planner here, how do I make all of my own wedding dreams come true? Where do I even begin? This blog is going to focus on THE BRIDE.. inner thoughts, plans, confusion, excitement and ideas.. from the source. From engagement party to planning a destination wedding and all that comes in between. I hope that this blog will assist all other future brides through the journey to becoming MRS. Being that we had decided even before we were engaged on a destination wedding, the only theme for an engagement celebration that made sense to us was a travel theme! We set my backyard as a rustic-chic travel experience with games, chalkboard, mason jars, light pink floral, and burlap galore! 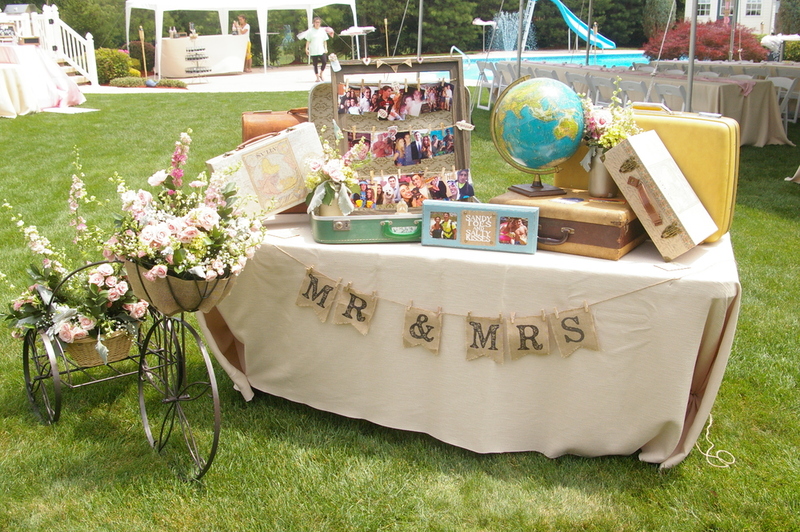 Our event designer staged suitcases, globes, photos, and props to make our party truly picture perfect! The engagement party is the first time for everyone to celebrate you as a couple! I took this as a pre-wedding celebration, knowing many of our guests will not be able to travel with us to Aruba for our wedding. I don't know about you, but I do not like being the center of attention. For me, games and entertainment helped take it from 'bride' to fun celebration.. that and a few signature drinks. Every bride needs her favorite signature cocktail! We ended our party with a fire pit and s'mores. The guys smoked cigars, the girls snuggled up in sweatshirts and we sat around the fire enjoying the night's end with the greatest company. I originally did not want an engagement party .. because of my center of attention phobia. I am so happy we had one. Celebrating a special and unique love is an amazing thing to have. Having people that love you as a couple is such a blessing. An engagement celebration is a perfect Kick off Party to your wedding journey. You had your engagement party.. what a blast... NOW WHAT? Share pictures and thoughts about your engagement party! What did you like? What were your challenges? How did you solve them? Did you do something different?